The missing link in the evolution of lizard has been discovered in Brazil. 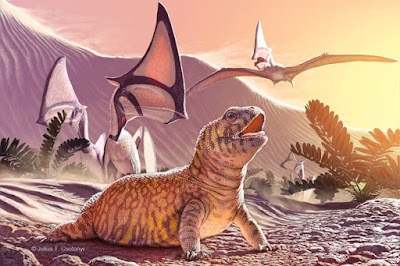 Paleontologists from the University of Alberta discovered fossil 80 million year old lizard associated more closely with chameleons and lizards beard, lizard found in Africa and Asia, rather than 1,700 species of iguanas found in South and Central America. The lizards are found in Africa and Asia are the acrodontan lizards, meaning they fused with the teeth in the upper jaw. The American iguana teeth, and their immediate families, are not like that. The new specimen is the first acrodontan iguana found in South America. Michael Caldwell, one of the authors of the study, said the fossil was "good evidence to show that at the end (period) Cretaceous, the southern part of Pangaea is a large part of the continent." Supercontinent Pangaea began to break into the continents we know today about 175 million years ago, when the land apart and so are plants and animals that live there. Thousands of years later, the animals evolve into new species. 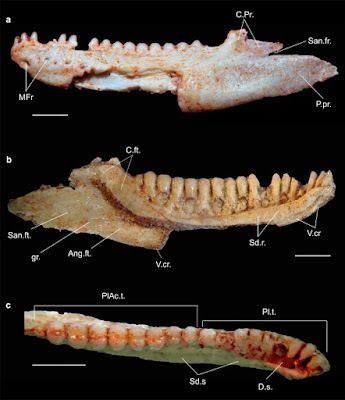 The study, published in Nature Communications, concluded "after separate, the acrodontan lizards and chameleons groups dominate Asia and Africa, and iguana lineage emerge from this acrodontan left alone in South America."